The other day, I noticed something odd on a bottle of ketchup. Because of my eating habits at home and at restaurants, I don’t see a lot of ketchup bottles, and so when I bought a bottle of Safeway brand ketchup so that I could make the delicious “Spicy Chipotle Toltec Barbeque Glaze” from Mark Miller’s Coyote’s Pantry (Ten Speed Press), I was surprised to see that the label said “Tomato Ketchup.” Not just “Ketchup”, but “Tomato Ketchup.” This seemed strange to me, because in this time and place, is there any other kind of ketchup? At first I thought the “tomato ketchup” label might be a regulatory issue, and so I looked into the Code of Federal Regulations (CFR) using the highly useable eCFR tool from the U.S. Government Publishing Office. Fortunately, a search for “ketchup” across the thousands of pages of the CFR results in just a few hits (and, interestingly, the top hit is “catsup” ). (i) Tomato concentrate as defined in §155.191(a)(1), except that lemon juice, concentrated lemon juice, or safe and suitable organic acids may be used in quantities no greater than necessary to adjust the pH, and in compliance with §155.191(b). (ii) The liquid derived from mature tomatoes of the red or reddish varieties Lycopersicum esculentum P. Mill. (iii) The liquid obtained from the residue from preparing such tomatoes for canning, consisting of peelings and cores with or without such tomatoes or pieces thereof. (iv) The liquid obtained from the residue from partial extraction of juice from such tomatoes. I made a quick survey of labels at Amazon – where a search on “ketchup” brings forth over 1,000 results, many of which are other condiments – and found that the majority of tomato-based ketchup products do not call themselves “tomato ketchup.” These include many fairly recent reformulations from health-food-type brands (e.g., organic, unsweetened, HFCS-free), small-batch artisanal brands, and some low price varieties. And, not surprisingly, there are some daring products in the Amazon catalog, like “Tru-POP ketchup popcorn seasoning”, and “Tracklements Sweet Mustard Ketchup” (which would be a blasphemous product at some hot dog stands, where the idea of blending mustard and ketchup is unthinkable). My theory about the word “tomato” on the big-brand ketchup labels is that it originates from the time when there was a variety of ketchup flavors, and so “tomato” was an important indicator. Before the 20th century, there were many kinds of ketchup because the term (and its spelling variations) referred to a savory, usually fermented, sauce that could be made from many bases. Some of the popular bases were mushrooms, walnuts, oysters, grapes, and of course, tomatoes**. In the United States those non-tomato flavors are completely gone. Factors such as high tariffs on British imports, decreases in domestic tomato prices, and lower manufacturing costs drove away the other ketchups. 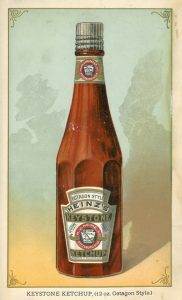 Andrew F. Smith’s Pure Ketchup*** recounts some of Heinz’s long history. 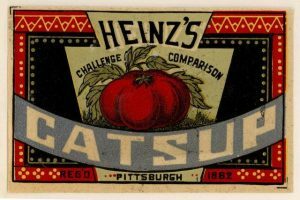 In a timeline from Heinz, we see that Heinz’s first tomato ketchup was introduced in 1876 and was labeled “catsup” without a tomato modifier but with a picture of a tomato on the label. An offering from 1883 (see illustration below) was similar. In 1890, the company introduced the famous keystone label, neck band, screw cap, and octagonal bottle shape for their tomato ketchup. 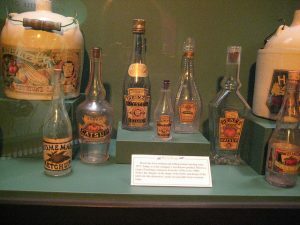 In that era, they offered a few different tomato ketchups (in order of quality): “Keystone or Octagon Ketchup”, “standard brand”, “Duquesne brand tomato catsup,” and one called “Home made catsup.” Smith writes that the price difference was significant: Keystone was about $0.60 per gallon, while Duquesne was about $0.25 per gallon. That the top and bottom brands don’t have tomato in the product name somewhat contradicts my conjecture here, but I haven’t seen the full labels – for example, was it “standard brand ketchup” or “standard brand tomato ketchup”? Or was the word tomato prominently displayed somewhere on the label? When store shelves were stocked with commercial ketchups that were not tomato-based, Heinz might have wanted to be clear about their product’s flavor base. But even though the other varieties have disappeared, Heinz labels their premier ketchup as “tomato ketchup.” I was unable to find a chronological collection of Heinz ketchup labels, so I don’t know exactly when they switched to the current tomato-based labeling. Thanks to the internet, it’s not hard to find mushroom ketchup. One example is from Geo Watkins at Amazon, which “was the secret success of many Victorian cooks with steak and kidney pies and puddings, roast meats, sauces and soups.” The sauce might also make an appearance on the shelves of stores that specialize in foods from the British Isles, and I wouldn’t be too surprised if ultra-British pubs in the U.S. also stock the sauce for use on chips, pies, and so on. * The full hierarchy of the regulation: Title 21: Food and Drugs, PART 155—CANNED VEGETABLES, Subpart B—Requirements for Specific Standardized Canned Vegetables, §155.194 Catsup. Deep in the archives of government, there might be an interesting story behind the use of “catsup” in the regulation’s title. *** Smith’s book is a scholarly study of the history of ketchup and touches on such subjects as early recipes for ketchup/catsup, the pure food movement of the early 20th century, brand development, and much more.